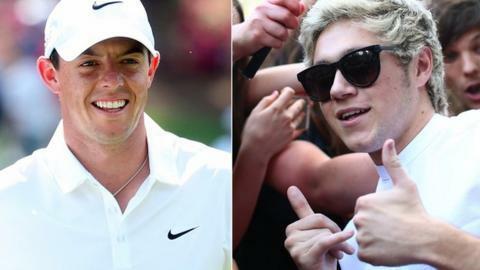 One Direction star Niall Horan will play alongside world number one Rory McIlroy at the BMW PGA Championship Pro-Am later this month. They will pair up again at Wentworth, playing alongside ex-footballers Phil Neville and Paul Scholes. "I'll probably be more nervous than in front of thousands with 1D," said 21-year-old Horan. "I'm hoping Rory will give me a few tips on calming the nerves." Horan, one quarter of the world's most famous band at present, caused a stir at the usually reserved Augusta National Golf Club during the traditional par-three event last month. The singer signed autographs for fans, played a tee shot that landed in the water and then tripped over before a television interview while carrying McIlroy's bag. "Niall and I had a good fun together in the par-three contest at the Masters and I'm looking forward to seeing him again at Wentworth," McIlroy said.